We've just received our latest Parragon Book Buddy book for review. When I opened the parcel I thought the picture on the front was great but saw the title and thought "oh I know that story already" but I was very wrong. As with each book we receive, Bubba instantly wants it open and to begin reading it which I find really lovely. 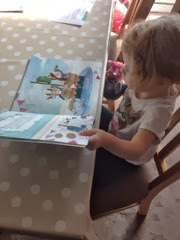 This book didn't disappoint me at all and I even caught Bubba having a little look through it on her own earlier in the week. 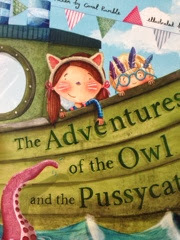 It's the story of a little boy and girl (the owl and the pussycat) who use a box in their living room to sail away for a year and a day. Each page is beautifully illustrated with the childrens adventures from seeing "A wiggly, squiggly eel, Dancing with a cheerful seal" to "A lobster playing catch with a crab who likes to catch"
It's got a nice rhyming tilt on each page with leads onto the next page neatly and becomes a quick page turner, although several times we had to go back a page or two so Bubba could take in all the wonderful pictures. We seem to see something new every time we look which is something I really value in a book, the ability to see it with fresh eyes each time. It's a real feast for the eyes and would appeal to both boys and girls alike, it's already a real favourite at our nightly reading before bedtime. There is lots to look at some I can't see us getting bored with this book any time soon.